Peripheral artery disease (PAD), its treatment and prevention of associated complications such as limb amputation are a special area of focus for the physicians at Cardiovascular Institute of the South. Still, understanding the disease can be confusing, particularly when there seem to be so many names that are used to describe it. In addition to peripheral artery disease and PAD, you may have heard the condition referred to as peripheral vascular disease or PVD. This often leads the two to be used interchangeably, and while the term PVD does encompass all cases of PAD, the term PAD cannot be used to refer to all types of PVD. Allow us to elaborate. The body’s vascular, or circulatory, system is comprised of the arteries and veins that carry blood throughout the body, as well as the lymph vessels that transport lymphatic fluid. The term peripheral refers to any part of this system that is outside of the heart. 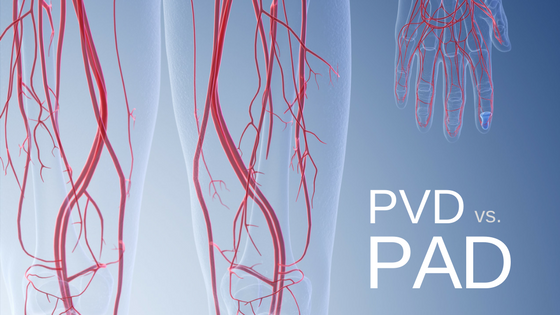 PVD is the name given to any disease that affects the vascular system outside of the heart, particularly in the extremities. How is PAD Connected to PVD? Peripheral artery disease (PAD) is a form of PVD that occurs only within the arteries. The key to remember here is that while veins are responsible for carrying oxygen-rich blood from the rest of the body to the heart, the arteries are responsible for bringing this blood from the heart to the rest of the body. In patients who are suffering from PAD, diseased arteries inhibit return blood flow, resulting in extremities that suffer from decreased blood supply and associated complications that can increase the likelihood of the development of chronic or non-healing wounds. What are the Different Types of PVD? PVD is considered to be either functional or organic, based on how it develops. Functional PVD does not result from damage or defect of the blood vessels. In conditions such as Raynaud’s disease, the vessels expand or constrict on their own in response to stimuli. Organic PVD, on the other hand, occurs when there is damage to vessels from sources such as inflammation or plaque buildup, or atherosclerosis. PAD is the most common form of organic PVD. While patients may hear and see the terms PAD and PVD used interchangeably, it is important to understand that, while PAD is the most common, other forms of PVD do exist. Patients who are experiencing symptoms associated with any form of PVD should consult their doctor right away. Early detection and management is critical to keeping these conditions under control, and treatments from PVD specialists such as those at CIS can help prevent some of the most serious complications that can accompany such diseases.